Shortly after the 1992 presidential election, photographers stalked him on the lawn of then–Arkansas Governor Bill Clinton’s mansion, luring him into camera range with catnip. He was the subject of a popular 1990s TV comedy, Murphy Brown, in which the star of the show unintentionally kidnapped him from the White House. He starred in a never-released video game designed for the Super Nintendo and Sega Genesis systems in 1993. In the game, he had to dodge various obstacles such as spies and corrupt politicians to warn the Clintons of nuclear threat. He appeared in Muppet form on Larry King Live for an interview with Kermit the Frog, who was guest hosting. He was the subject of a cartoon book and a song; he was a character in a cartoon strip; and he even appeared with President Clinton in a series of stamps in the Central African Republic. Who is he? 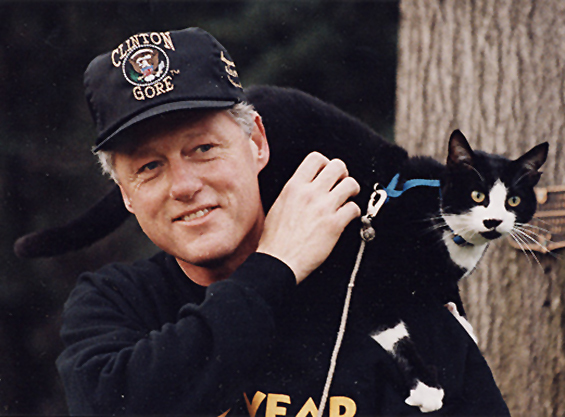 He is Socks, a black-and-white stray cat who reportedly jumped into the arms of Chelsea Clinton as she was leaving her piano teacher’s home in Little Rock, Arkansas in 1991. 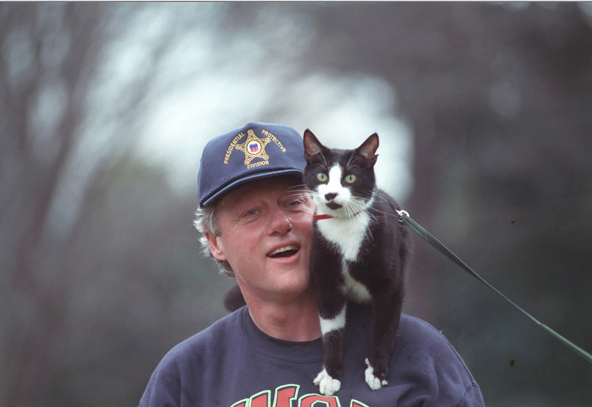 President Clinton and Socks go for a walk. Soon after the Clinton family adopted the personable cat with cute black spot beside his nose, he found his way into America’s heart. 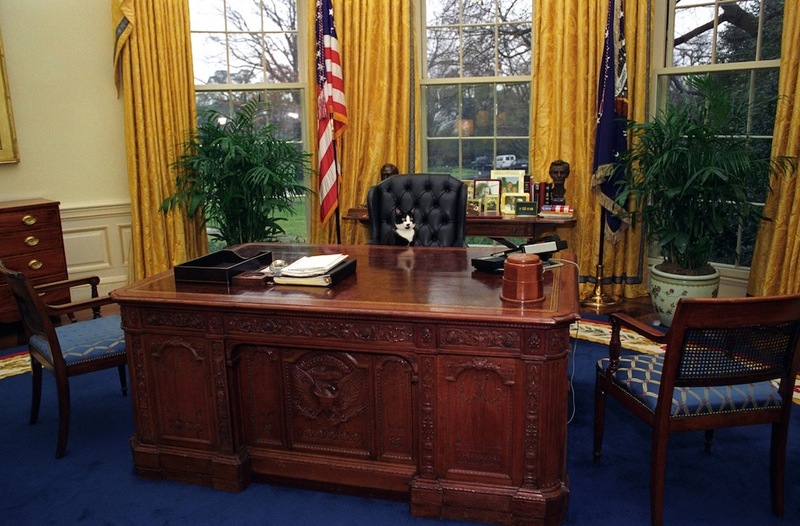 In fact, Socks was such a favorite with photographers when Clinton won the presidency in 1992 that the Clinton family had to ask photographers to leave the poor cat alone. Although he had freely roamed the property of the governor’s mansion, Socks was mostly confined to the inside of the White House for safety’s sake. He was a frequent visitor to the Oval Office, however, where he enjoyed sitting on the president’s shoulders. A wing chair in the West Wing, just outside the Oval Office, was another one of his favorite spots, and he also enjoyed hanging out in the office of Betty Currie, the president’s secretary. Hillary Clinton often took Socks along with her to visit children or senior citizens in local hospitals and to other events in Washington, D.C. He traveled in style in his own carrying case that was emblazoned with the presidential seal. At the events, he would sit on the first lady’s lap, seeming to enjoy the attention. In 1997, a chocolate Labrador retriever named Buddy joined the Clinton family at the White House. 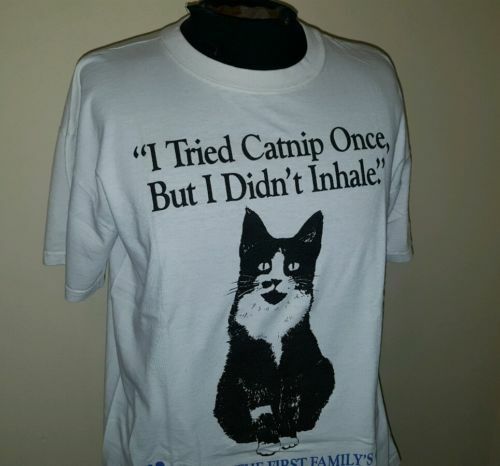 This clever vintage 1990s Socks-themed shirt is in the permanent collection of the Presidential Pet Museum. When the Clintons left the White House in 2001, they decided to separate the two animals by giving Socks to Betty Currie, so he went live with Currie and her husband in Maryland. Socks continued to make some public appearances there, especially in support of animal charities. I remember when he hissed at Buddy. It made me laugh bc that’s how our kitty greeted the new kitten. We couldn’t even keep the kitten and had to put them in separate rooms.